In fall 2015, the Klooster Center for Excellence in Writing will begin its sixth year of service. 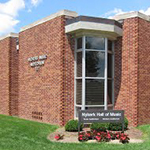 The Center is located in Van Wylen Library across from the Research Help Desk. Dr. David Cunningham, professor of Religion, serves as the Center’s Director. Hope College sophomore, junior, and senior students, who are recommended by faculty members, staff the Center. These students, called Writing Assistants or WAs, study a variety of disciplines. The Center’s purpose is to serve all Hope College students throughout their writing processes, from outline to final draft. Students schedule half-hour or hour-long appointments to discuss papers written for any subject with a WA. Professors receive write-ups, called session reports, that relay what the student reviewed during his or her appointment. In 2008, Hope College explored ways to help students grow as writers in their undergraduate career. Some groups examined the writing in the general education requirements and writing within majors. Another task force was appointed to investigate writing tutoring. This group was chaired by Dr. David Klooster and included representatives from the Academic Success Center, representatives from the Van Wylen Library, and Dr. David Cunningham. The team examined writing centers at other colleges to see their tutoring practices. Ultimately, the group recommended that Hope College should have its own writing center. The writing center, initially called the Writing Corner, opened in Fall 2010. The Corner was directed by Dr. David Klooster of the English department. Sarah Baar, the English Department Office Manager, scheduled the appointments. Eight students served as Writing Assistants. They held appointments at tables on the first floor of the library across from the Research Help Desk. When it first opened, the Writing Corner had limited hours: Sunday 7pm-10pm and Monday through Thursday 2pm-5pm and 7pm-10pm. In Spring 2011, the Corner continued to meet on the library’s first floor at the hours listed above. The number of WAs was increased from eight to eleven. In fall 2011, Dr. David Cunningham took over the directorship of the Center. During this semester, the Writing Corner became the Center for Writing and Research. This name emphasized the relationship between writing and research; well-conducted research should be presented through clear writing. The Center grew stronger in its relationship with the Research Help Desk in Van Wylen Library and maintains this relationship today. First, librarians assist students with research questions and finding sources. Then Writing Assistants help students develop their ideas in writing. Throughout the semesters that followed, the Center grew in several ways. The Writing Assistants received more training, beginning with a pre-college conference before the start of the fall terms and continuing throughout each semester at bi-weekly staff meetings. The number of appointments increased drastically, from 1,170 one-on-one sessions in Fall 2011 to 1,834 sessions in Fall 2014. Because of this increase, the number of Writing Assistants grew from sixteen in Fall 2011 to around 32 in Fall 2014. Additionally, the Center opened on Fridays from 10am-2pm and extended hours from 10am-11pm Mondays through Thursdays and noon-11pm on Sundays. The scheduling changed hands from Sarah Baar to student workers at the Research Help Desk. Presently, Writing Assistants who staff a reception desk at the Center oversee the scheduling of all appointments. Patti Carlson, the Van Wylen Library Office Manager, sends sessions reports, written by WAs, to professors. In fall 2014, the English Department and Dr. Cunningham proposed renaming the Center after Dr. Klooster, and the change was approved. On Friday, April, 4, 2014, a ceremony was held to rename the Center. Since then, it has been called the Klooster Center for Excellence in Writing. This name speaks to the value Dr. Klooster placed upon writing. He believed Hope College students, like all good writers, should strive for excellence in their writing. 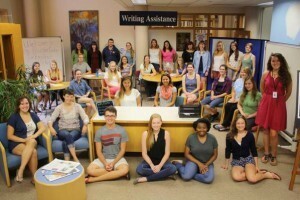 In Fall 2014, a leadership team of Writing Assistants was formed. The five positions are Student Director, two Senior Assistants, and two Junior Assistants. These Writing Assistants lead training at the pre-college conference as well as staff meetings. They work on special projects for the Center, such as developing promotional materials, informational materials, and schedules. The future leadership, a team of seven Writing Assistants, will continue with these tasks as well as deepen their understanding of the community of writing centers through research. Baar, Sarah. Interview by Allyson Hoffman. Hope College English Department Office, Spring 2015. Cunningham, David. Interview by Allyson Hoffman. Klooster Center for Excellence in Writing, Spring 2015. Cunningham, David and Allyson Hoffman. Klooster Center for Excellence in Writing Fall 2011-Fall 2014 Report, Spring 2015.